« Crash! Bang! Wallop! What a Picture! Astronomy provides a nice example that illustrates how easy it is to make things too complicated to solve. Suppose we have two massive bodies orbiting in otherwise empty space. They could be the Earth and Moon, for example, or a binary star system. Each of the bodies exerts a gravitational force on the other that causes it to move. Newton himself showed that the orbit followed by each of the bodies is an ellipse, and that both bodies orbit around their common centre of mass. The Earth is much more massive than the Moon, so the centre of mass of the Earth-Moon system is rather close to the centre of the Earth. Although the Moon appears to do all the moving, the Earth orbits too. If the two bodies have equal masses, they each orbit the mid-point of the line connecting them, like two dancers doing a waltz. Now let us add one more body to the dance. It doesn’t seem like too drastic a complication to do this, but the result is a mathematical disaster. In fact there is no known mathematical solution for the gravitational three-body problem, apart from a few special cases where some simplifying symmetry helps us out. The same applies to the N-body problem for any N bigger than 2. We cannot solve the equations for systems of gravitating particles except by using numerical techniques and very big computers. We can do this very well these days, however, because computer power is cheap. Computational cosmologists can “solve” the N-body problem for billions of particles, by starting with an input list of positions and velocities of all the particles. From this list the forces on each of them due to all the other particles can be calculated. Each particle is then moved a little according to Newton’s laws, thus advancing the system by one time-step. Then the forces are all calculated again and the system inches forward in time. At the end of the calculation, the solution obtained is simply a list of the positions and velocities of each of the particles. If you would like to know what would have happened with a slightly different set of initial conditions you need to run the entire calculation again. There is no elegant formula that can be applied for any input: each laborious calculation is specific to its initial conditions. One of the points I tried to get across in the lecture was that we can explain the pattern – quite accurately – in the framework of the Big Bang cosmology by a process known as gravitational instability. Small initial irregularities in the density of the Universe tend to get amplified as time goes on. Regions just a bit denser than average tend to pull in material from their surroundings faster, getting denser and denser until they collapse in on themselves, thus forming bound objects. This Jeans instability is the dominant mechanism behind star formation in molecular clouds, and it leads to the rapid collapse of blobby extended structures to tightly bound clumps. On larger scales relevant to cosmological structure formation we have to take account of the fact that the universe is expanding. This means that gravity has to fight against the expansion in order to form structures, which slows it down. In the case of a static gas cloud the instability grows exponentially with time, whereas in an expanding background it is a slow power-law. This actually helps us in cosmology because the process of structure formation is not so fast that it destroys all memory of the initial conditions, which is what happens when stars form. When we look at the large-scale structure of the galaxy distribution we are therefore seeing something which contains a memory of where it came from. I’ve blogged before about what started the whole thing off here. Here’s a (very low-budget) animation of the formation of structure in the expanding universe as computed by an N-body code. The only subtlety in this is that it is in comoving coordinates, which expand with the universe: the box should really be getting bigger but is continually rescaled with the expansion to keep it the same size on the screen. You can see that filaments form in profusion but these merge and disrupt in such a way that the characteristic size of the pattern evolves with time. This is called hierarchical clustering. One of the questions I got by email after the talk was basically that if the same gravitational instability produced stars and large-scale structure, why wasn’t the whole universe just made of enormous star-like structures rather than all these strange filaments and things? indeed look a bit like big solar systems, are relatively slow to form. When a non-expanding cloud of gas collapses to form a star there is also some transient filamentary structure but the processes involved go so rapidly that it is all swept away quickly. Out there in the expanding universe we can still see the cobwebs. This entry was posted on November 23, 2009 at 8:55 pm and is filed under The Universe and Stuff with tags Big Bang, Cosmic Web., Cosmology, N-body simulations, Sir Isaac Newton, star formation. You can follow any responses to this entry through the RSS 2.0 feed. You can leave a response, or trackback from your own site. Such calculations are done in pure Newtonian style, i.e. as if the speed of gravity were infinite. However, GR says that gravity propagates at the speed of light. This would make things more complicated. Is such a simplification justified? Actually, it is, even if the typical timescales are not long compared the light-travel time, because a proper treatment produces other effects which cancel to first order the effects due to the finite speed of gravity (aberration). See, e.g., http://arxiv.org/abs/gr-qc/9909087 . The fractal nature of large scale structure is very interesting. DO you think it’s because of the interplay between the expansion of the Universe and gravity in the early Universe? I always reasoned it must be because there was a regime where the 2 actions are similar enough to produce this chaotic structure. Is that any more than anecdotal? It’s not a simple fractal because there isn’t a single scaling dimension and there is a transition to homogeneity on large scales. The simulation I have shown is in fact is entirely scale-free (up to the scale of the box). However, in the standard cosmology the initial spectrum of fluctuations has a slope that varies only slowly and gravity itself is a scale-free process. There are good qualitative reasons therefore for thinking that the process is roughly self-similar. Actually, I could post about the fractal debate sometime which would probably agitate a few people! Please do add something about the fractal debate. I find the fingerprints of chaos on the Universe really interesting. So much so that I’m giving a talk about chaos on Friday (although only mentioning the self similarity of the 2df right at the end). Where is this talk you keep talking about? I’m giving it to Bristol Astro Soc but it made an impromptu appearance at the Scientific Society in Cardiff about a month ago when I stepped in for Haley (who had swine flu). You’re welcome to have a copy of the slides. 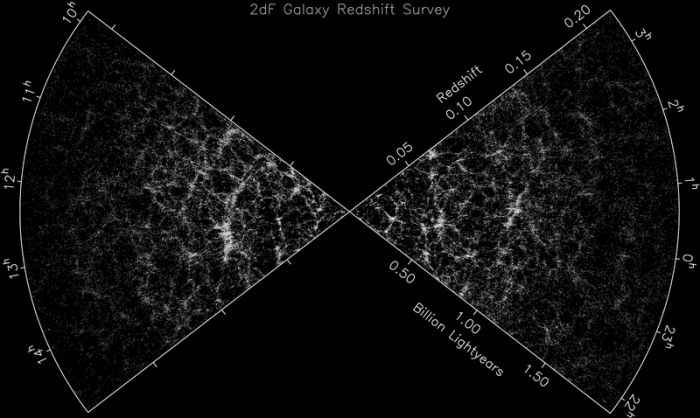 Since gravity has no intrinsic scale, it’s obvious that, over a range of scales, there will be self-similarity, i.e. a fractal structure. However, this breaks down at small scales due to “gastrophysics” and at large scales due to lack of time (since structure forms in a bottom-up fashion). It’s always the same group of people who claim that there is more fractal structure, and they have been claiming this for 20 or 30 years. I think you’re partly right. The large-scale structure present at any time does “remember” the initial conditions so it’s not obvious that gravity being scale free is sufficient to ensure fractal structure; you also need there to be no obvious scales in the initial conditions. That’s not quite true, as there are notable features in the power spectrum, the baryon wiggles…. I agree about the fractalisers. They have amazing software that produces the same fractal dimension whatever data you put into it. I should have said that scale-free gravity is a necessary but not sufficient condition. More mainstream cosmology once had the same problem. Back when POTENT was cited as evidence for Omega=1, I heard criticisms along the lines of “Yes, for a simulation with Omega=1, POTENT recovers this value, but it will also indicate an Omega of around 1 even for a simulation with a lower value of Omega.” I don’t know if anyone actually tested this with all the bells and whistles, or if it was just an impression derived from playing around with the code a bit. Of course, those who had a more objective approach were never convinced that Omega was 1.